Both of these obstacles, as I am now finding out, can and have been overcome with credibility. Firstly, the more positive coverage slacklining gets, the more people will hear about it, the less people will ask me what it is. Secondly, using other venues around the country that already have lines installed as case studies, vastly increases my odds of potential new venues agreeing to having lines installed on their premises. It hasn’t been easy. I have cycled miles with aching legs, spent my last remaining pennies on extortionate train fares, and sweated my body weight, all to visit venues that would have been perfect….during their construction. Two venues were so awesome. It was really hard for me to tell their owners that unless they wanted to rip up all that they had just spent months constructing, installing slacklines inside was just not happening. But with every failure, you’re that little bit closer to succeeding. Today was probably the most encouraging day I’ve had. I can’t reveal the venue yet because nothing is finalised, but at least they had a clue about rigging indoors and were keen to expand their horizons to include slacklining. So far, I have visited 6 venues. 3 are possible. Another two could have been amazing. I have also contacted several via email, but many have said no. It won’t be long before slacklining is popular enough that multiple venues will contact me to have lines installed. But for now, it takes the legwork of one individual to get that snowball rolling. Then momentum does the rest.. I will be honest and tell you that I underestimated this whole process quite vastly. In my head I had the ideal situation of me teaching at multiple venues across London within a couple of weeks. Bill coverage included. The reality is that in two weeks, I’ve had more no’s than yes’s, and have had to get a part-time job to cover my rent. For now. However, I have gained momentum with two of the most prestigious public parks in London; Clapham Common and London Fields, who are both keen to get the local community and members of the public on a slackline with my help. Clapham is looking promising, having an informal club meet every Saturday for slackliners, beginners, and anyone that just wants to have a go. To take money in a public park for lessons, I need a permit, which can be an arduous process. So for now, free weekly jams are good enough and valuable promotion and practice for me as an up and coming instructor. I have also met a great bunch of progressive physiotherapists, based at Balance Physiotherapy in Clapham, who are keen on the idea of having an indoor slackline at their practice for use in pre-hab and injury rehab. Roller Coaster really is an understatement, but seeing smiles on people’s faces who have tried the slackline for the first time makes it all worth it. 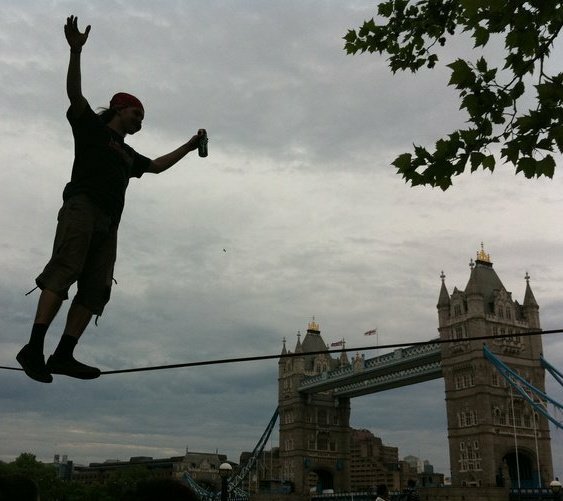 I’ve had a busy two weeks, so stay tuned on harrycloudfoot.com for more updates on how I’m bringing slacklining to London. Big thanks goes out to Ash Burleigh from TriSlacklining.com, to Sam Martin from the Clapham Common Users’ Committee, Damaris Sanders from London Fields Fitness Studio, Maverick Slacklines for sponsoring me and everyone I met at last night’s London Fields User Group meeting. This entry was posted in Slacklining and tagged Balance Physiotherapy, Clapham Common, harry cloudfoot, london, London Fields, London Slackline Club, Personal Trainer, physiotherapy, private lesson, slackline classes london, slackline physiotherapy, slackline sports injury, slackline workshops, slacklining by harrycloudfoot. Bookmark the permalink.